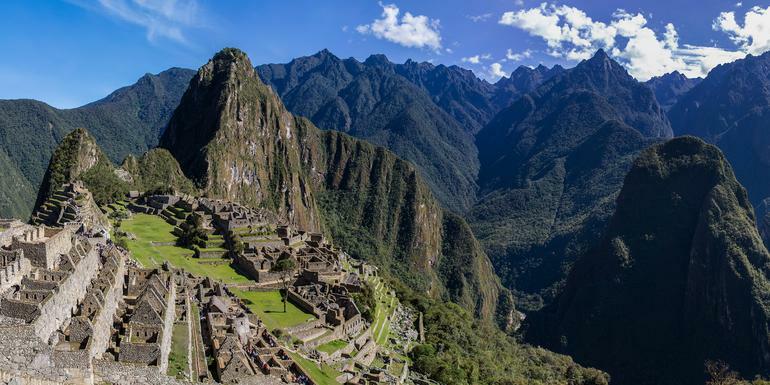 Experience some of South America’s incredible sites on a 16-day adventure that brings together the awe-inspiring landscapes of Ecuador and the vivid cultures of Peru. Explore the Amazon rainforest and sleep under its living, orchestral canopy during two days at our jungle lodge; follow in the footsteps of the Incas at iconic Machu Picchu; and feel at home among the people of the Sacred Valley. From the cacophony of the Amazon to the silent beauty of the Andes, echoes of this experience will resound long after the trip is over. Hotels (11 nts), historic hacienda (1 nt), jungle lodge (2 nts), hot springs resort (1 nt). Your Discover Moment: Cusco. Arrival transfer. Community local lunch. Overnight in an historic hacienda. Explore the Otavalo handicraft market. Cloud forest reserve visit. Three-day (2 nts) at an Amazon lodge with jungle excursions. Excursion to Cotopaxi National Park. Two-day Sacred Valley tour including Ollantaytambo, Moray, and Pisac ruins, and pre-Incan salt pans. Traditional pachamanca-style dinner. Scenic train ride and guided tour of Machu Picchu. Internal flights. All transport between destinations and to/from included activities. The capital of Ecuador sits in a valley between two Andes mountain ranges on the slopes of the 15,190 ft-high Pichincha volcano. Quito’s altitude is 8,960 ft. It has spring-like weather all year and so many artistic and architectural treasures that it was included in UNESCO’s Patrimony of Mankind program in 1978.